Water based, satin impregnating product, trasparent, colourless o colourful. It is a based on water acrylic polymers, special waxes and paraciticidal additives that garantee a longlasting life to the surfaces that have been treated. 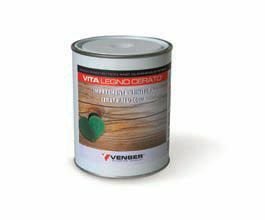 It is a very good product for any kind of wood. Internal and external use. High external resistance, very strong protection, it does not leave sticky traces (blocking free). Odourless, it is ideal for interiors.